A must-have for Musetta fans and concert-goers, it helps you keep up with Musetta while you’re on the go. 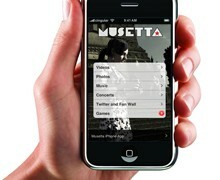 Install the Musetta iPhone App now from the Apple App Store: it’s free ! The rich features and unique content in this app include: watch the latest videos, browse photos, read blog posts and the latest news, find out about concerts near you, engage with other fans across Facebook and iLike, post concert photos directly from your iPhone to the fan community.